XV, 327 p., mit Schutzumschlag, 15,0 x 21,4 cm. With contributions by Rimvydas Augis, Wolfgang Berner, Yechezkiel Cohen, Alain de Mijolla, R. Horacio Etchegoyen, Eugenia Fischer, Michael Geyer, Rebeca Grinberg, Han Groen-Prakken, Maurice Haber, Jànos Harmatta, Alex Holder, Pearl King, Andrzej Kokoszka, Peter Kutter, Annemarie Laimböck, H. Leupold-Löwenthal, Uri Lowental, Alexander Moser, María Luisa Muñoz, Leo de Nobel, Johan Norman, Arnaldo Novelletto, Henning Paikin, Krzysztof Pawlak, Jerzy Pawlik, Virginijus Pocius, Esa Roos, Zbigniew Sokolik and Gábor Szönyi. It is well known that the cradle of psychoanalysis was in Vienna, the scene of Sigmund Freud’s activities at the beginning of the century. But how and when did psychoanalysis reach the other European countries? What developments did it undergo there? How did the different mentalities, political, and cultural backgrounds as well as the personal particularities of its respective advocates affect psychoanalysis? What was its position in the past and what is its position today? – These and other questions on the varied development and the present situation of psychoanalysis in the countries of Eastern and Western Europe are investigated by renowned psychoanalysts drawing on the experience and knowledge acquired in their own work. 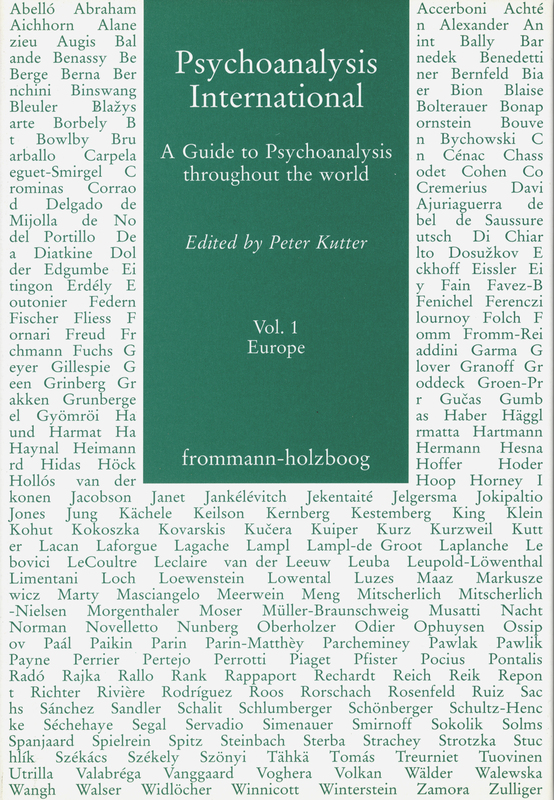 The result is »a new compendium on psychoanalysis in Europe« containing all up-to-date information; informative and instructive, at times as exciting as a detective story, it is possibly of interest even to non-analysts. I really do think that the book is extremely good, and should be in every psychoanalytic library.